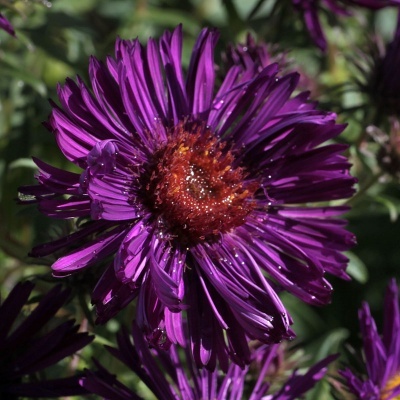 Not just the typical Michaelmas Daisy, we offer others with more interest. Many of the less common species are more or less mildew free and a better, moister soil will help with all species. 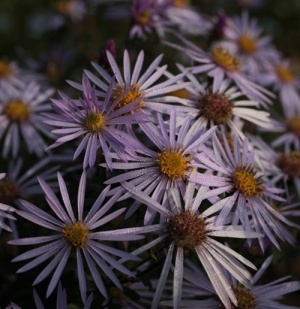 A very varied family now reflected better by some recent name changes - if you can't find what you are looking for under Aster, try the new genus names also found on this page. Read more about the name changes in our blog. 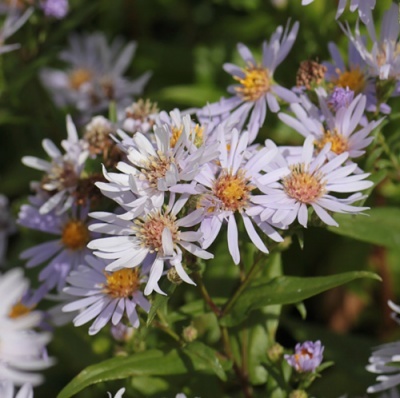 The Aster family is a huge group of plants, from most of the northern hemisphere, made up, basically, of what was left after the botanists had divided the obvious groups of daisies out of the family formerly known as Compositae, now known as Asteraceae. 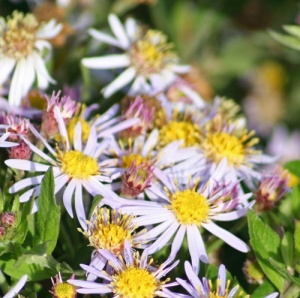 As a result some of the species bear little relation to each other and the new name changes make sense on a botanical level, just a pity some of the new names will be so hard to spell and pronounce compared to Aster! 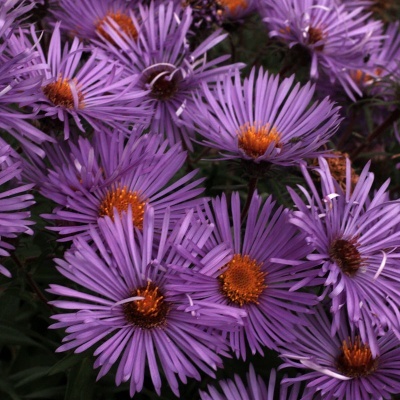 As a whole, the Asters are summer and autumn flowering perennials, mostly with good upright stems that produce interesting fluffy seedheads later in the year, very useful for naturalistic gardening. Most of them like an ordinary soil, not too wet or dry, in sun or a little shade but there are a few that prefer at least some shade. 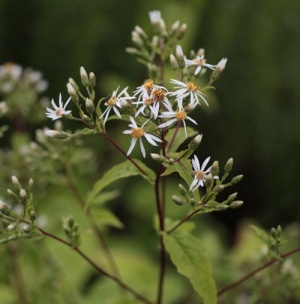 Most can be given a Chelsea-chop if required, cutting back the new growth in spring from c. 30cm to c. 15cm, to encourage side branhes and a denser, lower growing clump. It doesn't work with all of them, so ask or experiment before chopping the whole plant off! 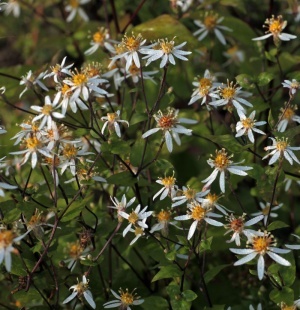 An unusual Aster with its shiny green leaves, black stems and masses of small white flowers with yellow centres that rapidly turn pink - and it likes shade! Low clumps to 60cm, flowers midsummer. Any reasonable soil in shade or part shade. Heads of relatively large white flowers over clumps of large pale green leaves. Summer to autumn flowering, to 60cm. Ordinary soil in sun or light shade. 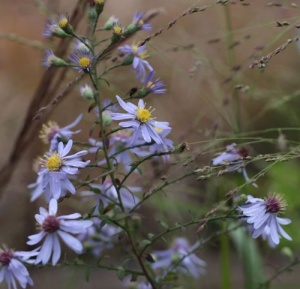 Spreading patches of willowy, dark brown stems topped with sprays of rich light purple flowers with golden centres in late summer. Ordinary soil, 30cm. Excellent and useful addition to the border. 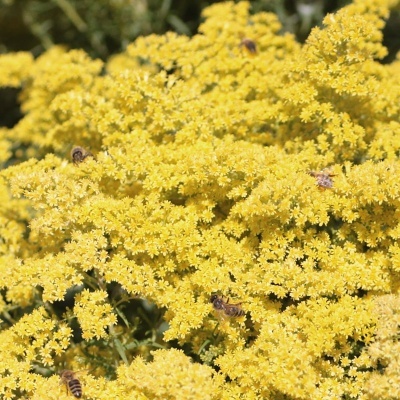 Quite unlike the common Goldenrods, this low growing, bushy plant is topped with sprays of fluffy lemon yellow flowers in summer and autumn. 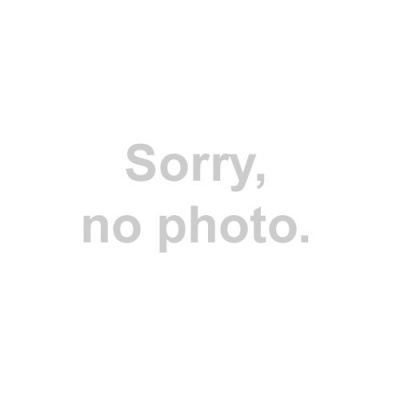 Ordinary soil in sun. 60cm. Clumps of deep green foliage and upright stems topped with heads of lavender-blue flowers in late summer. 50cm. Best in good soil in full sun, ideal with grasses like Panicum. 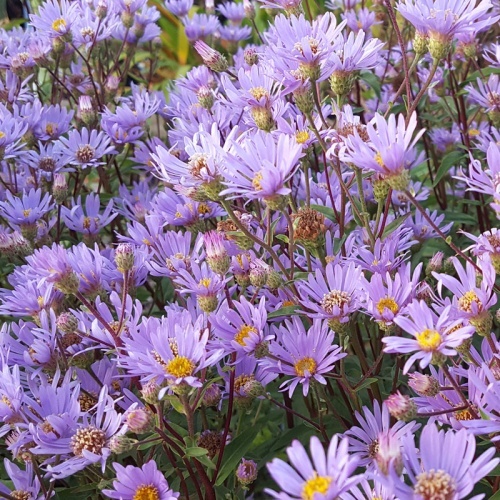 A rather shorter form with rich violet purple flowers in autumn. Mildew free in reasonable soil in full sun. 90cm. Large flowers of a light purple on this tough, mildew resistant cultivar. Good soil in full sun. 1.2m.